My 9 year old nephew loves Legos. When I noticed that the BOTW theme this week at Bento Blog Network will be Lego, I knew that I had to make another Lego themed lunch for him. I found the Lego pick idea at A Boy & His Lunch. Bricks: Pepper Jack Cheese and homemade crackers with cheese and carrots (recipe is from Baking Makes Things Better) I shaped them to look like Lego bricks. They were delicious! 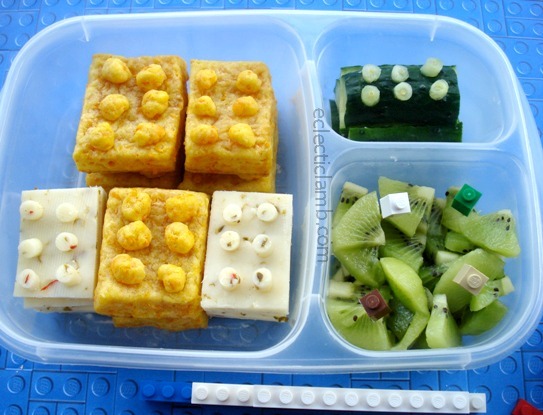 This entry was posted in Bento / Cute Food, Food and tagged bento, lego, vegetarian. Bookmark the permalink. iT IS NICE, LIKE LEGOS TOO, BUT WHAT IS BENTO??? I love this idea! My boys would have loved this lunch. Legos were their favorite! This is fantastic! I love how the lego theme is reflected in every detail. Good luck for this week link up. Thank you Winnie! My nephew loves Legos so much so he is happy for any excuse to make another one. Yes this one did not have minifigures but my other two lego bentos did. I love the lego bricks! So cool! Thanks for linking up to Meatless Monday!